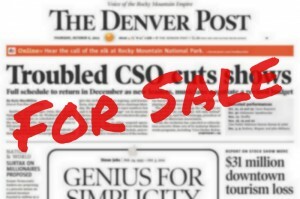 WELCOME TO THE new Denver Newspaper Guild website. Our goal is to create a dynamic site that we can use to communicate useful information, as well as create an online community to foster ideas and discussion among Guild members. With contract negotiations coming up, this is the forum Tony Mulligan and members of the Bargaining Committee will use to keep Guild members updated on how talks are progressing. I would encourage you to leave comments on posts to make your opinions known, to express ideas or just to offer up support. If you would like to write something longer for inclusion on the site, just give us a holler. We Are The Guild is a way we can all get to know each other a little better — it’s just a brief Q&A and a photo. Click here for an example (I’m the guinea pig); the questionnaire is here. Go ahead and fill one out while you’re thinking about it. The Grapevine is random collection of stories about MediaNews Group and Digital First gathered from around the Internet. There is no rhyme or reason to its organization; when I find something of interest, I’ll post it. These juicy bits will be categorized under The Grapevine. Feel free to add to The Grapevine by posting links in the comment section or emailing me. Take a minute to read Tony Mulligan’s post about the restoration of some wage concessions, and vote in the poll about what should be restored first. Be sure to check out Thomas McKay’s Newsroom Guild Update. Take a minute to vote in the poll about how you think you’ll fare in the upcoming contract negotiations. Also, the website is mobile friendly, so check us out on your phone. The Denver Newspaper Guild also maintains a Facebook page, so please “like” us to receive updates from that. So, welcome — come on in and take a look around. This website is very much a work in progress as we figure out how to best use it to communicate with Guild members, so feel free to offer up suggestions and criticisms — I’d like to hear from you. You can email me at hamm.kevin@gmail.com.